The international course on diagnostic and therapeutic endoscopy will present the latest developments in gastrointestinal endoscopy. International highly recognised pioneers and outstanding experts in this eld will attend the meeting. Four sessions will cover a variety of endoscopic live procedures supplemented by presentations, case discussions and «State of the art» lectures. Interactive teaching is a main focus of the meeting. 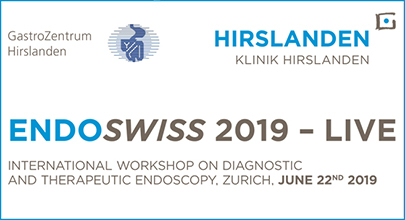 A «Masterclass imaging-teaching course» will be separately organised and conducted by the Japanese Gastroenterological Endoscopy Society (JGES) and the Swiss Association of Gastrointestinal Pathology (SAGIP) one day before. Focus of this course is the detection, description and classi cation of premalig- nant and cancerous GI lesions. The course follows the guidelines and policies of ASGE and ESGE for live demonstrations and is designed for gastroenterologists, surgeons, practising physicians, endoscopy nurses, trainees and students. Conference language will be English with simultaneous translation into Russian by native-speaking Russian endoscopists. The meeting will be live-streamed on Endo Academy and Endoscopy Campus.